British romantic poet who is noted for his Romantic narrative poems. A daughter, Augusta Ada, was born during a brief marriage to Annabella Milbanke (1815) who left him the following year, because of an abusive relationship. Byron never saw them again. His daughter became renowned as Ada Lovelace, a mathematician credited with writing the world's first computer programme while associated with George Babbage. “Newton, (that proverb of the mind,) alas! Science Quotes by Lord George Gordon Byron. Lord Byron - On Newton's “Playing on the Seashore” illustrated quote - Pebble Background - Medium 500px. 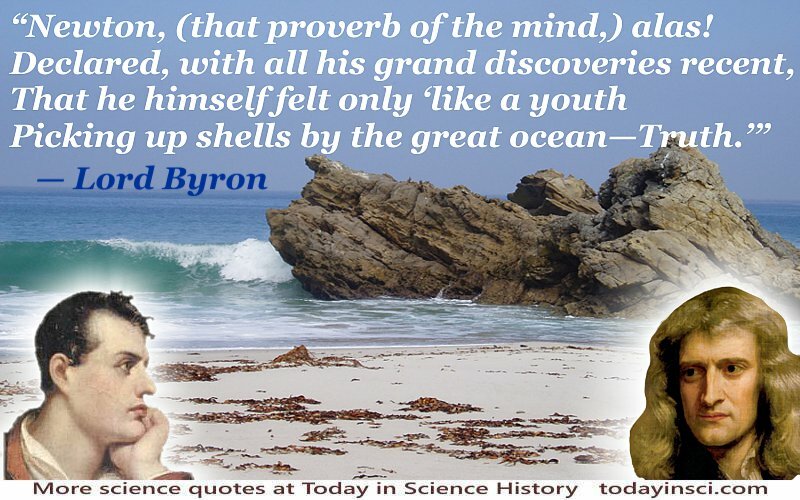 Lord Byron - On Newton's “Playing on the Seashore” illustrated quote - Pebble Background - Large 800px. Lord Byron - On Newton's “Playing on the Seashore” illustrated quote - Ocean Background - Medium 500px.